My mission is to help people overcome chronic pain, have more energy, and get back to doing activities that you love without your body telling you it hurts. As a Ki-Hara practitioner, it is my primary goal to help you live your life with more ease, less pain, better sleep, and improve your overall health. I want help you “stretch free” of aches and pains, get stronger, more agile- and most of all get back to doing activities that you love without your body telling you “I can’t do that anymore- it hurts”. Many of my clients tell me they’ve “tried everything under the sun”, and have come to resistance stretching as a last resort. I can definitely relate- I too, was in a lot of pain and tried everything I could think of before I resorted to resistance stretching. I’m here to help you discover how resistance stretching can be the “short-cut” to getting your body back to a healthy state, and you don’t have to spend your valuable time and money trying everything else first. About 12 years ago I found myself sitting in a doctor’s office with a swollen knee- a result of teaching one too many fitness classes. I was told that at age 36, I had the beginnings of arthritis, and would eventually need surgery. Tears welled in my eyes as the doctor told me the best thing I could do was “avoid knee bending activity”. I wanted to stay physically fit, so I tried swimming, and ended up with swimmer’s shoulder. I immersed myself in a regular yoga practice and pulled a hamstring (twice) and also developed sacroiliac dysfunction. My body seemed to be accumulating more injuries the more I did to try to stay healthy. I tried all sorts of alternative therapy- massage, chiropractics, Rolfing, corrective exercise- all which were and are absolutely wonderful, extremely helpful, and highly recommended for optimal health, but did not really “fix” the underlying problems. I tried everything I could think of, but nothing was really working. I had heard a little bit about resistance stretching from a few of my colleagues, but I didn’t really believe it would work. I kept thinking, “I’m already super flexible from yoga, right? How is this going to be any different?” Despite my skepticism, I was desperate, so I went to my first resistance stretching training in Chicago. I figured if nothing else, I would learn how to stretch my personal training clients safely. The results? My clients loved it. The stretching was not only increasing their flexibility, but also improving their posture, helping them sleep better, and reducing muscle and joint pain during and after workouts. I was often able to eliminate a specific pain or tightness in just a few stretches! It felt so rewarding to be able to help people. Personally, the more I practiced it on my own, the better I felt. The epiphany for me came after an afternoon of hiking while on vacation, which normally would have laid me up for a couple of days. I was surprised to wake up the next day feeling just fine. I thought, “this is working!” And the best part- I could do these stretches on my own! No body is “perfect” though- it’s ongoing maintenance and self care. I still have aches and pains now and then, but resistance stretching is now my “first resort”- it’s the most effective tool I have. I continue to learn more so that I can better help people. I have attended advanced trainings all over the country, and am so grateful to find this bodywork and to learn from such amazing, supportive teachers. 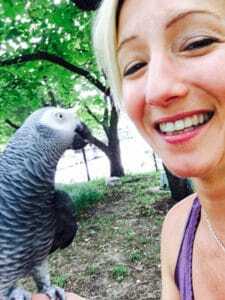 I enjoy sewing and designing, spending time cooking with my husband, and chatting with my African Grey Parrot, Max. Read an article about my Annamaya clothing line here: https://www.stlmag.com/style/q-a-with-annamaya-clothing-creator-alison-hyde/.